The quality and newness of your Galion Motor Grader Tires can make or break the safety of your worksite. Working with tires that are worn out can land you with fines, or can end up putting your workers in severe danger. You can keep your worksite safe and your Galion Motor Grader running optimally with Construction Tread Tires for Galion Motor Grader. 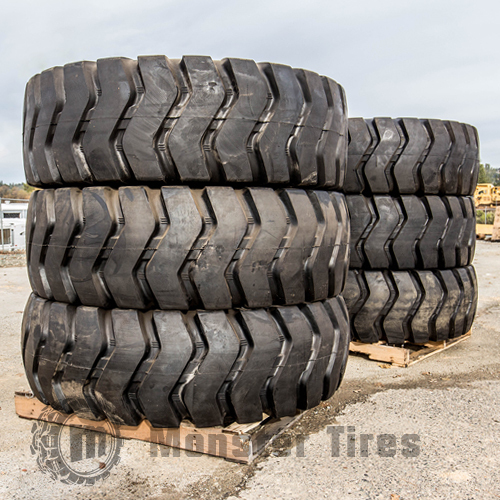 At Monster Tires, we have Galion T600 Motor Grader Tires, Galion T500 Motor Grader Tires, Galion A600 Motor Grader Tires, Galion A550 Motor Grader Tires, Galion A450E Motor Grader Tires, Galion A400E Motor Grader Tires, Galion 850 Motor Grader Tires, Galion 503A Motor Grader Tires, Galion 500 Motor Grader Tires, Galion 160 Motor Grader Tires, Galion 118A Motor Grader Tires, and Galion 104 Motor Grader Tires. With Monster Tires, you can rely on us to get you the Heavy Equipment Tires you need to get your piece of equipment rolling again. You can choose a Set of 4 Tires for Galion Motor Grader, a Front Tire Set for Galion Motor Grader or a Rear Tire Set for Galion Motor Grader. We also have the full range of Galion Motor Grader Tire Size Options. We offer High-Quality OTR Tires for construction companies and home owners. Trust in Monster Tires for your next set of Galion Motor Grader Tires!